Mario Vellutini in the front yard of his El Granada home. I used to watch Mario Vellutini bending over in the fields bordering Highway 1 in El Granada. That’s where wild daisies the color of butter grew in abundance, waist-high. Wearing baggy gray trousers and a worn hat, the thin, pale old man searched for clumps of wild mushrooms where the ground was rich. For dinner he cooked them with chicken, country Italian style. One day while Mario was gathering mushrooms I went to talk to him. I hoped he would tell me secrets about Prohibition, when the Coastside was home to shadowy figures, rumrunners and bootleggers– and a madam or two who called the shots. He delighted me when he talked about his close relationship with John Patroni, a powerful man during Prohibition. Patroni owned the popular Princeton restaurant called the Patroni House–the old roadhouse was torn down in the 1950s and today the Half Moon Bay Brewing Co. stands near the site. Some people called the husky Patroni “the padrone” for he was the boss of Princeton-by-the-Sea in the 1920s and 1930s when the sale, possession, and drinking of any kind of alcohol/liquor/whiskey was illegal. John Patroni was the Coastside padrone but Mario Vellutini, who, when he was in his early 20s lived at the Patroni House, called the padrone, “Big Daddy.” John Patroni was the kingpin and a wealthy rumrunner, Mario Vellutini, who lived at the Patroni House, told me. 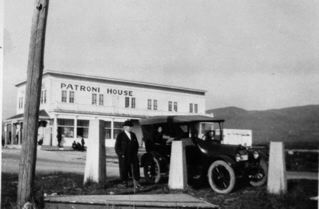 A narrow thoroughfare separated Patroni’s lively roadhouse from what is known today as Pillar Point Harbor but in the 1920s the high seas weren’t interrupted by a breakwater system. During Prohibition rumrunners used the pier across the way to unload whiskey at night. Mario worked for Big Daddy, and rumor has it that Vellutini watched out for the best interests of his boss, making certain that nobody was cheating him. Those were heady times for the Coastside, famous up until then for the endless fields of artichokes. But the artichokes took a back seat to Half Moon Bay which became better known as one of the biggest supplier of illegal booze on the West Coast. When the Prohibition agents headed for Patroni, the 81-year-old Vellutini said, somebody called from Redwood City to warn him.